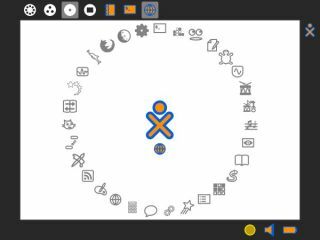 The popular open-source Sugar Learning Platform, a Linux based OS that was developed for the OLPC project, is now available to run from a 1GB USB flash drive. Sugar Labs has announced that the rather splendidly monikered Sugar on a Stick v1 Strawberry is immediately available, and can be used to reboot any PC or netbook directly into Sugar. "One year after its founding, Sugar Labs is delivering on its education promise for its second million learners," commented Walter Bender, founder and executive director. "Sugar is preferred because it is a superior learning experience for young children: engaging while being affordable," he added. "Sugar on a Stick is a great way to try Sugar without touching your computer's hard disk. It is also well suited to slower, older PCs and low-powered netbooks. "There is a version for the OLPC XO-1 and it will ship with the newer XO-1.5 laptops in the fall." Sugar offers a distinctive UI and was developed to be simple to use so that children in more deprived areas of the world can learn IT skills.